This spectacular piece, commissioned by the Markham District High School Wind Symphony, Bill Thomas conductor, is a large-scale dramatic work for concert band. Chromatic harmonies and dissonant intervals create tension and excitement. 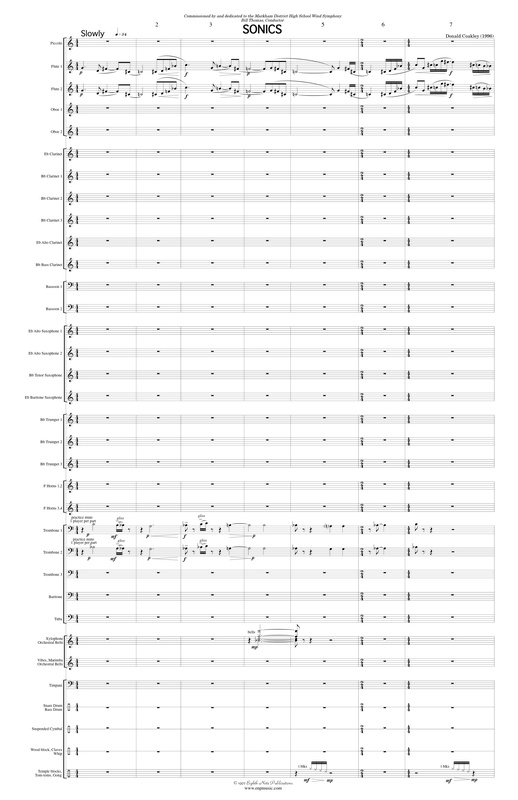 Mr. Coakley's brilliant writing for the many band pieces he has done has reached a pinnacle with this new composition. Sonics is around 12 minutes in length and touches on a variety of compositional techniques. Within the sonata-allegro form themes are introduced and developed throughout the ensemble. Contrapuntal elements as well as many meter changes (7/8, 5/8) keeps the pace of the piece quick and energetic. This is a monumental addition to concert band literature and will quickly find it's place with other Grade 6 level band pieces. The composer describes this work as "acidy" and that term seems to best capture the mood of the piece. Sonics is a very difficult work that would prove to be a challenge for a university/college level ensemble. Professional bands may also consider this piece because of the virtuosity that is required from all players.